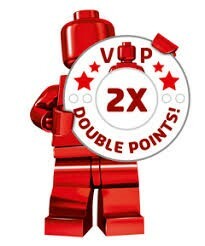 LEGO is offering double VIP points on all purchases at shop.LEGO.com from today until 31st March. This is on in the UK too! Also in Australia. But Big W just had 25% off like 2 days ago so eh. I can confirm this is indeed available in Canada as well. available for norway as well! Czech Republic double VIPs as well. Probably whole world promotion. Good news -- it seems to be worldwide, for a change. In the physical stores as well? Just right before the release of the April Star Wars sets.. Of course. Drat. Shame the Mustang is out of stock...! I'm waiting for the free Avengers tower, which I assume is still happening on Endgames release at the end of April and will be available in the UK. Someone should get the UCE milinium falcon with double points. Man! That would be $80 right there! Really wish they still advertised promotions like this in advance. Yeah, I would've waited on all of my recent over spending, but I would've then added even more Want List items to my order. Then I would've had more VIP points to buy more of their stuff... albeit for free. Crap, I think they caught onto my shenanigans. Time to get extra modulars I suppose! Woo!! And the email says it's for both online and in store. Now to decide which to get: The Winter Holiday Train or Voltron. They're both at risk for potential retirement this year. Hmmm seems like the right time to pull the trigger. Corner Garage and Apocalypseburg on their way! Not available in all countries. Heck, I get sets massively discounted elsewhere, so I guess I should not be bothered. How the heck did I miss this? Will be redeeming my current points balance on the roller coaster. Have to check the budget to see what else I can manage.